Provides thorough coverage of our world history from prehistory through the 1500's, with special Topic Centers on key civilizations and regions, including the ancient Near East, Egypt, Greece, and Rome; ancient and medieval Africa, Asia, and the Americas; and medieval Europe and the Islamic World. Each civilization’s history is brought to life through tablet/mobile-friendly videos and slideshows, primary sources, maps and graphs, timelines, suggested readings, and suggested search terms. Editorially Curated Topic Centers: Ancient and Medieval History features specially selected content—including articles, sharable slideshows, videos, primary sources, and more—that provides a study guide for a particular civilization. Primary Sources: Ancient and Medieval History includes thousands of primary sources, many with introductions that provide context and background—perfect for document-based learning and strengthening critical-thinking skills. 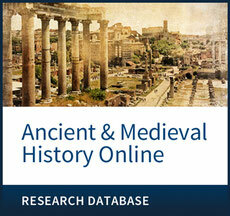 Authoritative Source List: Ancient and Medieval History features a complete inventory, by type, of the extraordinary amount of expertly researched and written content in the database, including articles from a wealth of award-winning proprietary print titles, primary sources, images, videos, timelines, and a list of contributors to the database—information researchers can trust.